Save Money and Learn how to make wreaths from the comfort of your home! “Wreath Making of the Month Club”…an ONLINE private group where YOU learn to make designer wreaths every month without going to a class or leaving your home. How many times have you searched for a special wreath but couldn’t find what you like? Or you needed a wreath in a specific color only to find the store didn’t carry it? And how many times have you seen a designer wreath with a high price tag and thought, “I can make that for less”? That is when you use the creative spirit God gave you and start creating wreaths yourself. Not sure on where or how to start? I’ve been making wreaths for over 20 years, and I would be honored to teach you how to make professional, designer door wreaths! It’s so much fun making beautiful creations for your home, family, friends, and the world. You’ll love being able to create holiday and seasonal decor for your home without spending a fortune! Need help with color selection? Want to learn to attach signs securely, without squishing? Don’t know where to place flowers or how to give a wreath three dimension? Need more ideas on where to buy supplies? Can’t figure out what ribbons to choose? Secretly want to be a bow making ninja? Spent hundreds on supplies just to have them sit instead of putting them to use? Are you an introvert at heart who wants to learn at home while sipping a beverage in your jammies at your own pace? Want to perfect your wreath making skills so you can sell more? Just want to learn how to make a professional, quality constructed wreath? 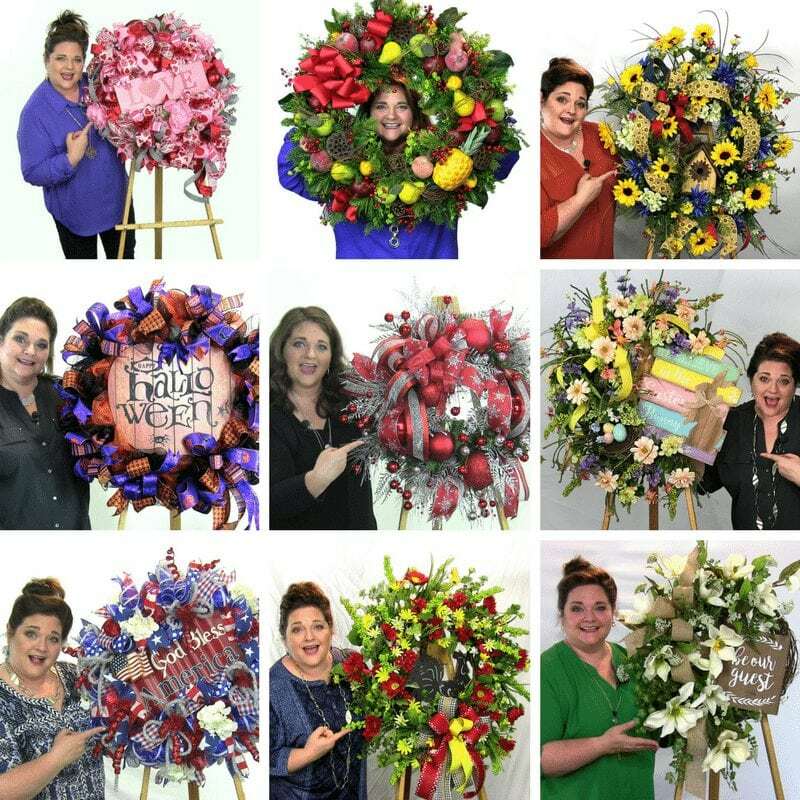 Over the past 10 years, I’ve taught over SIX THOUSAND women and men how to make designer wreaths, and I know I can teach you too!! Don’t take my word for it, scroll down below and see the success other club members are having with my training. Access to watch EVERY training video we’ve ever recorded for our Wreath of the Month Club group; plus bonus videos and freebies! That’s over 50 videos total. A new professionally recorded and edited training video each month showing you how to make a beautiful wreath using different types of mediums you can watch even after you cancel. A supply list to download for the featured training video for that month and were to buy. Access to multiple, private Facebook Live broadcasts of me making a different style of wreath and explaining how to make it. A chance to be in the “hot seat” where I critique your creations giving you one on one coaching. Access to me and a community of other wreath creators to give you feedback, encouragement and ideas. A list of commonly used vendors (both wholesale and retail). A complete List of Tools of the trade and where to purchase. Tips on how to choose the best supplies for wreaths. PLUS… a Facebook Live giving you wreath selling tips each month and access to videos, never seen before explaining the various wreath bases, tools of the trade, color selection and more. You’ll learn how to make lots of seasonal and holiday wreaths, as well as wreaths that can be displayed year-round. Every month you’ll have access to multiple new tutorials so you’ll always learn something new to improve your skills! Are you a wreath making newbie? I welcome you! This club is for beginners and experts alike! Have you ever taken a class where you just didn’t get it? Don’t worry! I teach in a very easy manner and I promise, you WILL get it! Do you already make wreaths? I welcome you too! Anytime you get around other creatives, you WILL pick up a trick or two, maybe learn about a new product or discover something you didn’t already know. Do you want to make wreaths for an income? You are welcome here and this will keep you in the loop with new techniques, trends and styles as well as, start to build a portfolio of what you can accomplish. Join TODAY and receive instructions for making all of these wreaths and more! After your purchase, click on the My Account link in the members portal area. This gives you access to our video vault of over 50 training videos and files. There’s a link at the top directing you to my private Facebook Group as well as a link to download the current month’s supply list. All of the live teaching is done inside the Facebook Group (but you don’t need a Facebook to participate just access recordings of the lives in the membership area). During the first few weeks of the month, I’ll upload a new training video showing you how to make a specific wreath with a supply list. During the next weeks, I’ll take any questions you have after watching the training. During the third and fourth weeks of the month, join me on a Facebook LIVE broadcast where I show you how to make a different style of wreath (typically one I need to do for a customer or list in my Etsy shop) or host guest designers who’ve I invited to go live in the group. The last week of the month, I want you to show off your designs to me and the group if you choose. Do I get access to prior month’s videos? YES this is an update for 2018! You get streaming access to ALL the videos ever recorded in WOTMC (plus bonuses) as long as you are a current paying member. That’s over 50 videos. What if I need to change my payment option after I’ve joined? You can always log into your account www.southerncharmwreaths.com/my-account to change your payment options, suspend or cancel your subscription at any time. I can’t wait to get to know you better inside the group! Don’t delay in joining, another season is just around the corner and your door is screaming for a new wreath! Plus, you deserve some fun and relaxing ‘you’ time creating. I mean if God made you a creative spirit, He fully expects you to use it so then let’s create! CLICK ADD TO CART AT THE TOP OF THIS SCREEN! Monthly payment of $29.95 … $27! Payment Policy – By purchasing this product, you understand that this is a recurring membership. 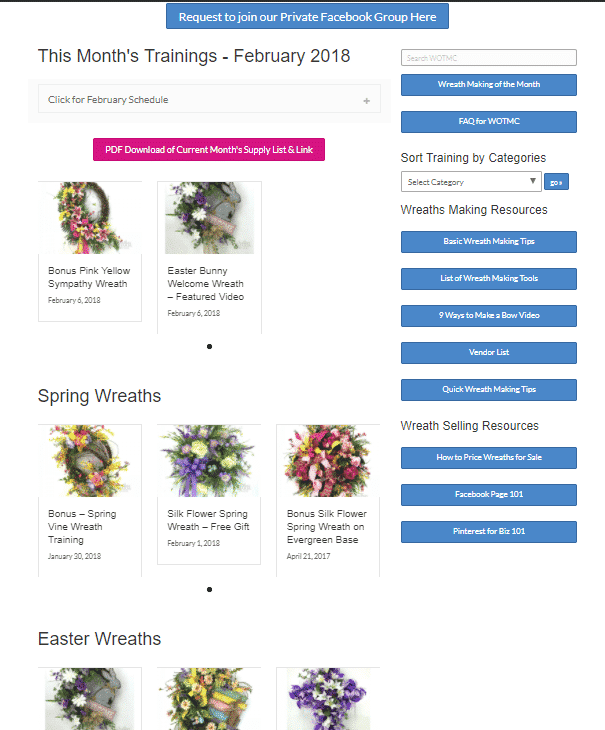 You agree that your membership will automatically renew and charge your credit card on file unless a cancellation is made by either logging into your account at www.southerncharmwreaths.com/my-account or by contacting us here . No refunds will be made after 3 business days of the charge date. GRAB YOUR SPOT NOW BY CLICKING ADD TO CART AT THE TOP OF THIS SCREEN! I joined Julie’s Wreath Making of the Month Club when it first began and have been more than pleased with the training! Julie is so much fun to learn from and the quality of the training is superb. 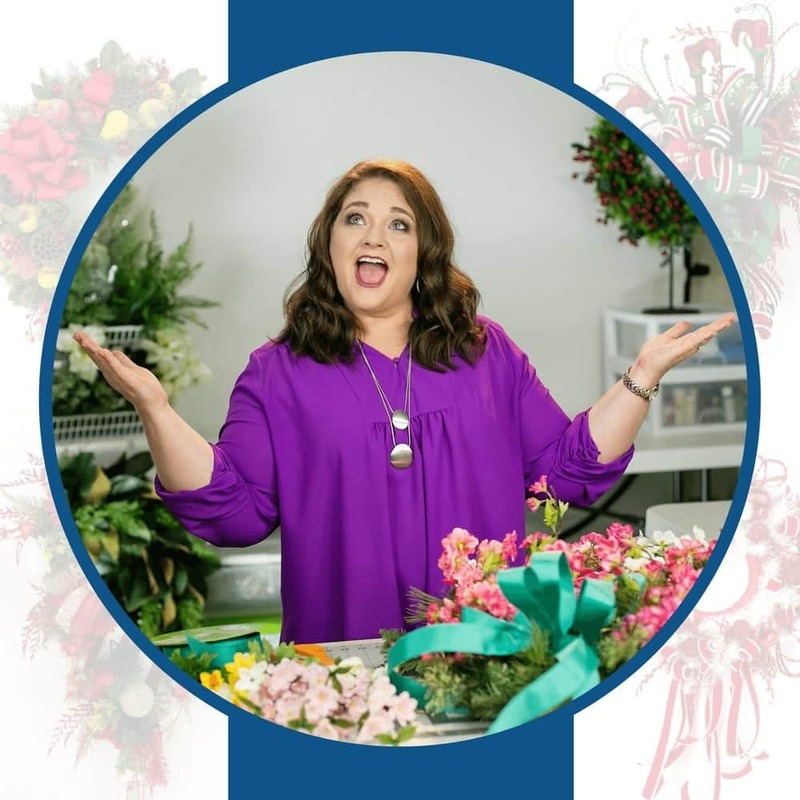 Julie really goes above and beyond to offer all the training you need to learn how to make a different specialty wreath each month including bonus training videos. If you’re new to wreath making, or even an experienced designer, you will not be disappointed! Highly recommend this training!! I think I was one of the first ones to join Julie’s Wreath Making of the Month Club and I have so enjoyed this. I have learned a lot of things so far, and look so forward to each month. She is a wonderful teacher and love watching her design these wreaths. I just joined and am so thrilled. I could listen to Julie all night long. Her Wreath of the Month Club tutorials are different than the free ones she offers. Even better! She is so thorough and does not leave out any details. She will guide you step by step in order for you to create your wreath. I love learning brand new techniques and can hardly wait until next month, which is just around the corner. I joined Julie’s Wreath of the Month Club when it first began back in December. I love the fact that she covers different mediums and materials and gives lots of tips and tricks into her thinking and Design. Along with the training videos, I greatly enjoy her bonus live videos each month where she will demonstrate a second wreath for her shop. The help and support of the group is astounding and I greatly encouraged anyone who is considering joining to definitely do it. you will NOT be disappointed. Even if you are new to wreathmaking or a veteran wreathmaker, you can absolutely learn something new each and every month! I believe that this is an investment in my small business…..learning new techniques and offering something new and different each month! Also, she keeps up with the new trends and shares them as well! Jule is a great teacher and leads you step by step. I look forward to it each month! Julie is so wonderfully talented! If you desire excellent wreath making skills and lots of fun with a fun group of people? Them you need to sign up and join us. You will learn a lot and enjoy the chats and support when you really need it! I am glad I joined, very happy and always excited for the next project! I am so excited to make my first wreath using Julie’s wreath of the month tutorial. I kept seeing all the wonderful wreaths members have made. I’m gathering the supplies for the March wreath. So excited! I joined Julie’s Wreath Making of the Month Club from the very beginning and all I can say is, WOW! I have learned so much from her as she makes it easy and fun. I never thought I could make wreaths like the ones she demonstrates, but she is such a great instructor, she makes me look good! I highly recommend enrolling in her classes. You will never be disappointed with the tutorials or lessons learned. Come on and join us! You will love it! I was a novice when I started 2 months ago julie’s wreath making club. There is so much information available and too for reasonable amount. I have learnt do much from her and can see how sloppy I was before. I must admit I haven’t made any yet as we are moving and can;t have supplies at the moment around the house but in a month or so when I settle down I am going to make each one of these. Julie, is blessed with a wonderful skill by god and she shares each and every bit of it. Joining this wreath club has gave me so much guidance and confidence to do what I love! Julie it’s an awesome teacher, she explains each step in her videos in such a way, it’s easy to follow! I’m so glad I decided to join and I’m sure there’s not one person in this club that doesn’t value her time put into her videos! Plus get access to her Facebook page where we post our wreaths and interact with other members! I highly recommend joining too everyone that lives to make wreaths! I am enjoying Julie’s Wreath Making of The Month so much! I am learning so make different ttpes of wreaths that I would not have attempted before. I am so excited for the new training each month! So worth it! Highly recommend joining any of Julie’s programs!! Joining the “wreath of the month club” has been one of the best decisions I have made! Although it’s been only a few months, I can tell a huge difference in the quality of wreaths I make. People comment on how “professional” my items look. Julie is always fun and entertaining and quick to respond with any questions I have had. Sign up for her classes now…You will not be sorry!! I saw on a friends fb that she liked Wreath making of the month club. So I clicked on it and was amazed by the wreaths that Julie makes!!! I wanted to be a part of this club so I signed up! Julie is a very talented teacher/instructor. I highly recommend this club for all ages and stages of wreath making. She not only gives you the supply list but complete details on making the wreaths. Thank you again Julie for all you!! God bless you! 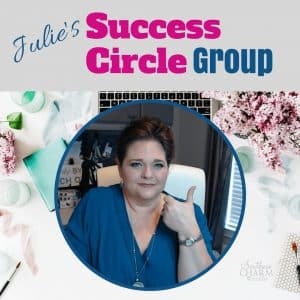 I joined Julie’s Wreath Club when she started this new venture and I love it!! Julie is an excellent teacher, takes her time explaining the what, why, how of doing things. The Club is more than just learning how to make a new wreath every month — it brings together a group of people who want to learn and in turn shares ideas and variations of wreaths. As a group, we encourage each other and offer suggestions. Julie’s #hotseat review is great — she will help you take your wreath to a new level. This is a “safe” place to learn. PLUS, as a member of the group, we always get a bonus wreath to learn. Sometimes she will challenge us to make a wreath based on one flower and we’ll see the many different wreaths the members create using that one flower. I highly recommend Julie’s Wreath Club (and all of her products) to anyone who is interested in making more professional looking wreaths – either for yourself, friends, and family; or, if you want to be in the business of selling wreaths. Either way — you should join today! I have been admiring Julie’s wreaths for a long time. When she announced the Wreath Making of the Month Club, I joined immediately! I watched the videos provided and finally got up the courage to make my first wreath by following Julie’s clear step-by-step videos. Julie’s support and the encouragement of the other members has been great. I am looking forward to learning more wreath making techniques in the months to come. If you are looking for a way to express your creativity, I highly recommend joining. I have been a member of Julie’s wreath making of the month club since Nov 2016. I have completed all of the wreath tutorials that she has offered and the results are amazing. I have experienced significant growth in my wreath making skills and have learned so many new making wreath techniques. I find each months wreath making tutorial very effective because it completely focuses on the goals that I want to achieve to build my skills in wreath making. The tutorials also generate a lot of new creative ideas for other wreaths I have made. Julie’s Q&A sessions are wonderful! She makes the extra effort to ensure all of her members succeed in making the wreath for the month by giving extra tips and tricks she uses . She also answers all members questions thoroughly and with demonstrations. She also offers a second wreath tutorial as a bonus in a Facebook live session. So you get two wreath making tutorials a month! WOW!!! Julie’s wreath making of the month club is one of the best investments I have made. I highly recommend joining this group if you are interested in learning how to make wreaths or just perfecting your wreath making skills. You will not be disappointed! Julie only delivers the best. Thank you Julie Siomacco! I have been a member since September 2017 and I have thoroughly enjoyed these tutorials and the interaction from all the individuals that are in the wreathing community. Every LIVE and or recorded session has been very knowledgeable. It gets you out of your box sorta speak so that it expands yourself into a better designer. You could not have a BETTER TEACHER! Oh and did I mention FUN….yes folks we have FUN in these sessions. Everyone is supportive with each other and the creativity just oozes from each individual even if they are just starting out. I highly recommend (from the beginners to advance) to join the Wreath Making of the Month Club! The possibilities of wreath making and other creative treasures are limitless!